Nowhere in the world is gun control as controversial as it is in the United States. A retired military and foreign affairs expert makes the case for allowing Americans to have and carry guns. The recent killings at the Washington Navy Yard have stirred up talk of gun control. However, the fundamental problem is the growing number of Americans from socially disrupted and psychologically unstable backgrounds. This, not gun proliferation, is our problem. When I was growing up and well into my adulthood, there was no gun control, whatsoever, except the 1934 Firearms Act which only addressed control over submachine guns and sawed off shotguns, the weapons of choice of gangsters, but of no one else. On the other hand, there was, until almost 1960, virtually no street crime and one could safely walk anywhere at any time in all of our major cities. The moral decline and disruptions of the 1960s resulted in family disintegration and above all, increasing out of wedlock births. These births were greatly encouraged by the ill-advised Aid to Families with Dependent Children Act (AFDC) of 1965, designed to aid single mothers but stipulating that, for a woman to be eligible, no adult male could be in the household. The result was a progressive and massive disintegration which hit black families especially hard. Up to this baleful period, the vast majority of children of all races grew up in intact families with mothers and fathers who were married and stayed married and who both loved and disciplined their children. The boys especially grew up with fathers who were male role models. These boys rarely got into trouble. One then never heard about “black crime” because there was so very little of it. Now, with 73 percent of black children born out of wedlock, we have, for a number of years, had generations of black boys growing up undisciplined, with no fathers or male role models, and only too often with mothers who are immature, uneducated or uncaring. This has led to drug addiction, bad health habits, poor school performance followed by poor job performance. Most significantly, this has spawned epidemics of black crime previously unknown in this country. With only 13 percent of the population, blacks have, for some time, committed most of the murders and other serious crimes in this country -- and blacks have been the principal victims of these crimes. This is a major social problem that no amount of gun control will ameliorate. Black leaders are too often loath to denounce this great black misfortune for fear of turning opinion against blacks or of being called “Uncle Toms”. Gun control has done, and can do precious little to rectify this tragic situation. Observers in other countries wonder why so many Americans seem so attached to guns. (Over 80 million own them.) This is, in large measure, due to our history. When my forefathers came from Great Britain to America at the end of the 1600s, they landed in a frontier situation where guns were essential both for protection against hostile Indians and for putting meat on the table. As we, as a people, steadily moved west (including some of my family) they remained on the frontier with a continuing needs for guns. People were living on the frontier until the last two decades of the 19th century. I had grandparents who experienced frontier living. Also our Revolution started with citizens bringing their own guns into the battle. All my male ancestors had guns, and I started shooting a real gun (a .22 rifle) when I was seven. Gun safety was drilled into us. We rarely had gun accidents and none of us ever shot at anyone else until we had to in World War II. When I turned 12, I first started shooting a shotgun, it was a 12-gauge Browning autoloader (semi-automatic). I was shocked, by the way, to hear that such pure sporting guns had been banned in Australia, thinking it could happen here next. Gun foes -- and there is no better name for them -- strive through incremental gun controls to ban guns altogether. This became abundantly clear when they succeeded in getting the Washington DC government to effectively ban the use of any gun by law-abiding citizens. Criminals, of course, ignored it. At that time, Washington had, and continued to have the highest gun crime rate in the nation. This certainly contributed to gun owners’ viewing any kind of gun control with suspicion. Among other steps, gun foes have tried to demonize semi-automatic weapons, seeking their total ban (as in Australia) even though they have been in common use since before World War I. 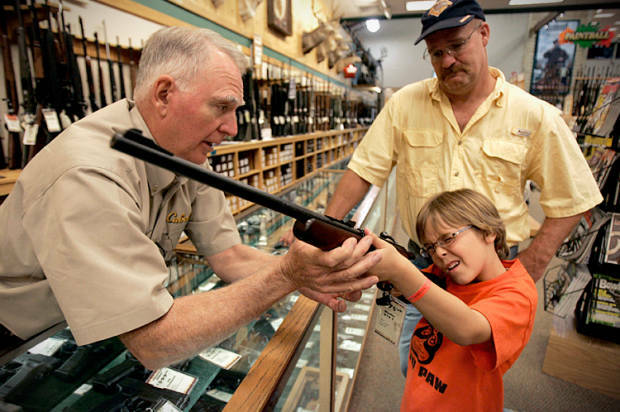 Gun owners for the most part have rightly become suspicious of almost any kind of gun control. For example, it would not seem to be unreasonable for gun owners to register their guns. As the result of a tragic school massacre in Dunblane Scotland in 1996, relatives of the murdered school children and others pressured parliament to enact a total ban on handguns in the UK. This went into effect in 1997 and began with the confiscation (with compensation) of all the 240,000 handguns that had been duly registered by law-abiding citizens. That was clear proof of where gun registration could lead. After the confiscation, a knowledgeable Labour MP declared that this still left between a million and two million handguns in the UK. It is notable that the crime rate in the UK increased steadily after this law went into effect. I would not be affected if semi-automatic rifles were banned, since for the last 45 years I have used only muzzle-loading rifles for hunting. Also I personally couldn’t care less if large capacity rifle magazines were banned -- were it not for my conviction these are only salami slices in reaching the total ban goal. There is, I believe, one gun control which does succeed in preventing guns from falling into the wrong hands: the instant background check (IBC) required in buying guns in the US. However, a major deficiency in it was discovered as a result of the 2007 massacre at the Virginia Tech University, the deadliest in recent times. The shooter, it turned out, had a record of mental illness. The much maligned National Rifle Association (NRA) worked with Congress to include records of mental illness in the instant background check data. The Virginia Tech shooting was also abetted by the university declaring the campus “gun free” in violation of the Virginia right to carry (a firearm) law. The shooter knew, therefore, that he would encounter no armed student who could interfere with his shooting spree. Now all the states have “right to carry” laws which have tended to reduce their crime rates. In point of fact, more crimes are prevented in this country by armed citizens than by the police. Estimates of crimes prevented by these citizens go as high as 2 million a year and there is a great deal of anecdotal evidence from local papers and police blotters of this. The Navy Yard shooter had a police record and a record of mental problems. Clearly a gap in the background data for the IBC enabled him to purchase a gun, and other gaps enabled him to get a secret security clearance. This is now being worked on. As the Wall Street Journal recently pointed out, the killer was also aided by the Navy Yard’s being a “gun-free area”, like the VA Tech campus. Many Americans, especially the urban ones, often think of gun owners as being “good old boys” driving a pickup truck with a gun rack. I suppose some abroad might also agree. Actually gun owners and defenders of the right to own guns are a cross section of our society. I am a former career diplomat and a former university professor as well as a devotee of the fine arts. An unlikely ally of ours is Harvard professor and avowed liberal Lawrence H. Tribe, one of our leading authorities on constitutional law. In his widely used handbook Tribe says that the 2nd Amendment’s reference to the people’s “right” to be armed trumps the Amendment’s preamble reference to “A well regulated Militia…”. The latter has long been used by gun foes to prove that the Amendment covered only those in a militia. The essence of Tribe’s argument was used by the Supreme Court in ruling against DC’s gun ban. Banning guns is an unwarranted attack on a constitutional right that fails to address the real social causes of gun crime. William Stearman recently published his autobiography, An American Adventure. He served on the National Security Council staff from 1971-1976 and 1981-1993. This article is published by William Stearman and MercatorNet.com under a Creative Commons licence. You may republish it or translate it free of charge with attribution for non-commercial purposes following these guidelines. If you teach at a university we ask that your department make a donation. Commercial media must contact us for permission and fees. Some articles on this site are published under different terms.